Announcement Turn-Around Time around is currently about 7-10 business days. Order Easter Baskets by April 7, 2019 for USA delivery by Easter. Life can be "a little frayed," but there are so many fun things to bring joy to it. All of the items that are listed in my store are things that I personally use and love. They were created to make everyday tasks, or celebrations, a little happier. I am always happy to custom make an item in your favorite color. Turn-Around Time around is currently about 7-10 business days. Order Easter Baskets by April 7, 2019 for USA delivery by Easter. Love my new Dish Mat, even prettier than the photo :) Well made, works perfectly and great size! Perfect!!! Thank you for the custom order. 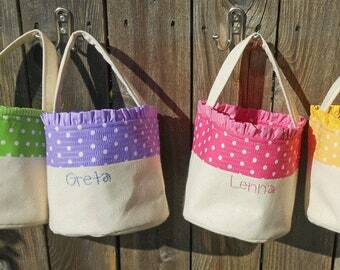 love these little baskets for Easter! Thanks for quick shipping in time for Easter. Easter Basket season has arrived. My busiest time of year. 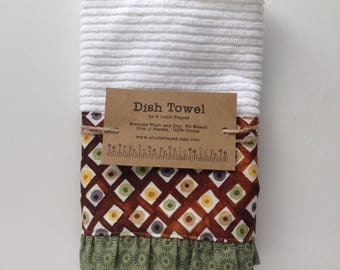 Why does doing dishes seem happier with a dishmat? Completely Handmade Canvas Easter Basket!! I grew up with sewing as a part of my life. I don't really remember learning --oh, wait, there were those times I ended up crying in the laundry room, because Mom was cooking dinner and I couldn't wait to learn how to sew on a collar-- but besides that, sewing was what we did. And what I still do, whenever I get the chance. A few years ago I started my etsy shop "A Little Frayed" on a whim. My two sisters had their own shops, and the more I found out about etsy, I wanted to give it a try. So I jumped in! Everything in my shop is completely Handmade. All of it is designed, produced and shipped by me. Most are things that I use in my own house, and love. And hope others will love, too. Your information is only used by me to fulfill your order.